Scotland and Hibernian Ladies midfielder Kirsty Smith insists she has no fear about big games coming up for club and country. 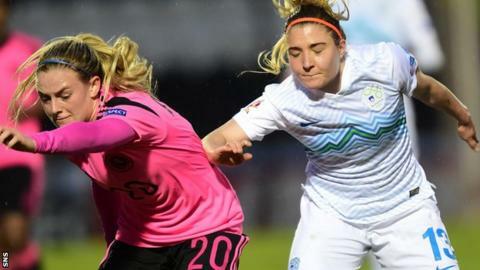 Smith was in the Scotland side that defeated Slovenia 3-1 on Friday at the Paisley 2021 Stadium to take a step closer to next summer's European Championships. Next up in June they will host group favourites Iceland. "I think it's exciting to have that game," Smith told BBC Scotland. "Obviously that's one of the bigger games of the campaign and hopefully we can get through it with a win and get another three points." Scotland are now six points clear of Iceland after winning five games out of five in Group A, though the top seeds have two games in hand over Anna Signeul's side and travel to Belarus on Tuesday. Jane Ross' low first-half shot into the corner of the net put the hosts in front, but it was cancelled out by Kristina Erman's looping header. However, Ross restored Scotland's lead with a close-range finish and Kim Little's second half penalty made it three. Smith admitted the Slovenians made it a more difficult than expected night for them as they blunted the home side's usual spark. "They made it hard for us," said the 22-year-old. "They were really compact and didn't let us play through them so it made it difficult. "A part of their game is that they are really physical and like to put in the tackles and be strong and obviously we have to counteract that. "Nevertheless we got some good goals through some good play." Attention now turns back to the Scottish Women's Premier League, where Hibernian Ladies are looking to go one better than last season where they finished runners-up in all three competitions. Smith feels they are well equipped to win the league this season after being a close second last year, despite already dropping points to Aberdeen. Hibs failed to get the better of Glasgow City in five clashes last season, and face the champions on 1 May. "We have started quite well and are still trying to find our feet on how we are playing," she said. "So far we've done well as a team. "We have got a really good team unit and that will help us through the season. "I think dropping points has helped us in a way, and if we are going to push for any cup or league we have to be able to beat Glasgow City regardless anyway." Smith also feels the increased competition from the signings of Abbi Grant, Rachel McLauchlan and Sarah Ewens will be a big factor for the capital side. "We obviously have got a bigger squad this year and that's only going to help us push for the league and the players can help us fight for that league."